It’s one of the worst days of your life. A package arrives. It contains a beautiful, handmade sweater, perfect for you. And maybe, for a moment, you find solace. But where did it come from? Who made it? Confined to their own secluded world, Brin and Henry—a remarkably close sister and brother—craft beautiful sweaters, designed to comfort those in need. One day, exquisite material arrives. It’s so striking that Brin can’t help but wonder whom it’s destined for. The questions haunt her until she breaks the rules and ventures out to find its recipient. And the siblings’ perfect, self-contained but restrictive world, begins to unravel . 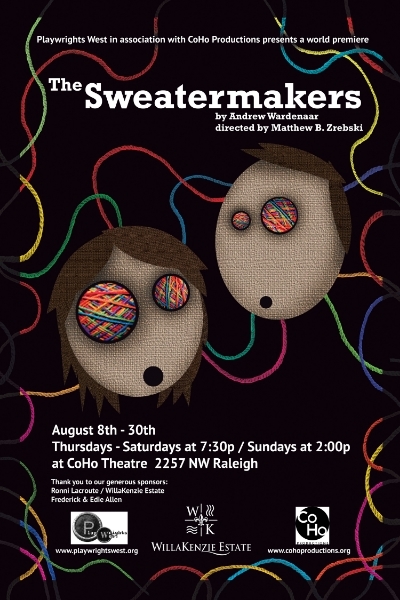 . .
Part mystery, part coming-of-age story, The Sweatermakers—woven with humor, psychological insight, and magic realism—affectionately explores our need for human connections, the change that brings, and its sometimes painful consequences. Help Bring The Sweatermakers To Life! In addition to a generous sponsorship from Ronni Lacroute and WillaKenzie Estate, Playwrights West is thrilled to announce that we have received a generous pledge from Frederick & Edie Allen to support this production by matching up to $2,000 in contributions from other sources. If we can achieve this match successfully, this production will be FULLY FUNDED before opening night - meaning every penny of ticket sales goes back into operating to help make our organization sustainable and support our other programs. Will you consider making a gift today to show your support for keeping original theatre alive in Portland? YES! I Support Live Theatre!